What is the Difference Between BOAT CLEAN and BOAT SCRUB? What is the main difference between BOAT CLEAN and BOAT SCRUB? 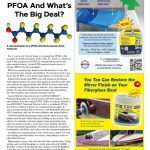 I use BOAT SCRUB for my deck cleaning and it works fine (and smells good too), but some of your articles seem to indicate that BOAT CLEAN should be the first one to use before applying SURE STEP. We have found that using both cleaners before applying Sure Step, especially the first time, will give you Guaranteed results every time. If you skip a step, you may or may not have problems later on, such as streaking, yellowing, shortened life of the Sure Step, slippery decks, especially when wet. The prep work is very important if you want guaranteed great looking results. Your non-skid decks must be perfectly clean and free of pollutants and oxidization before applying the Sure Step. 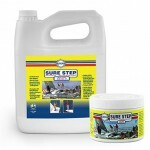 Sure Step will seal in anything that you don’t remove which could result in discoloration, streaking or product failure. That’s the reason for the two different cleaners. Boat Clean Plus is an emulsifier type cleaner with excellent surfactants that penetrates deep into the pores of your gelcoat and removes organic grime, traces of sun tan oil, greasy residue that may have fallen from the sky in the form of pollution, bird and bug droppings and their residue, etc. It also helps to loosen up and remove mold release wax on new boats that can cause yellowing. This product is free rinsing, non corrosive, and biodegradable, which means that it will not damage your gelcoat in any way or leave behind a residue which could effect the adhesion of the Sure Step. Many deck cleaners are corrosive and will yellow your decks, etch the pores in the gelcoat, opening them up to trap more dirt and are difficult to rinse away. Boat Clean Plus is a “water activated” cleaner and is sold as a concentrate to lessen cost. You normally cut it about 1 to 4 with water for heavy duty cleaning, like prepping your decks, and about 1 to 20 for boat washing. Even at full strength, it will not harm human skin or any substrate, yet it’s a very powerful cleaner. Boat Clean Plus is very versatile and can replace over 20 other cleaners on your boat. Boat Scrub is a deoxidiser that also contains a leaching agent called Hypexine. 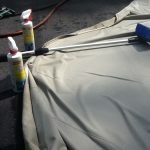 In addition to removing oxidized fiberglass, it will also remove stains, scuff-marks, yellowing, streaking and anything that the Boat Clean Plus may not have removed. Although used as a substitute for rubbing compounds, it does not cut integral gelcoat the way that compounds do. 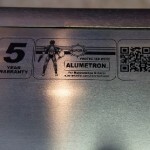 It only reacts with and removes the damaged fiberglass. Boat Scrub can be used for regular maintenance without degrading the gelcoat and is recommended for deep cleaning all the fiberglass on your boat prior to application of a new coat of polish each year. That’s why you have had such good success using it as a non-skid deck cleaner. It is also non-corrosive, free rinsing and biodegradable. The amount of time required to prep the decks is probably twice as long as it would normally take you to scrub you decks using a deck brush and cleaner of some sort. If you have been maintaining and cleaning your decks on a regular basis, it could take less time. If there are years of chalk on your decks, if they have become gray from atmospheric fall out and dirt, have rust stains, ground in sneaker prints and bird droppings, or other neglect, getting your decks “Aurora Clean” will take a little longer. It’s still not that difficult to get professional results. Everyone agrees that the results are definitely worth the effort. Not only will your boat look better but its value will increase the appreciably.